Hit the makiwara. If you have been practicing for a while you will likely be transmitting tons of pressure into your target. Anyone can see – and hear – that you are affecting the world around you. But what is less recognized is that you are affecting the world within you as well. All forces occur in pairs, and these two forces are equal in magnitude and opposite in direction. So when the makiwara post bends back under the power of your punch, and the sound of the impact echoes through the room any karate practitioner can tell you its not only the things outside you that are influenced. You are changed as well. Power is communicated through your body at the same time. With every impact your muscles absorb power, your connective tissues toughen, your hands are conditioned, your mind focuses, your hand-eye connection improves and the power of your will to generate power, also is affected. For every action we take on the world around us there is a corresponding effect on the world within us. This differs from the Newtonian principle in that the inner transformation is not always equal, and the effects are not limited to the physical. The implications of this fact are the single most important point to understand if we are to have a truly cultivated life. What we do is who we are. If you want your life to be different: do different things. If you want to master the martial arts, go master the martial arts. Engage in the action of training many hours every day consistently and sincerely for decades without regard to the results and no problem you will become the real thing. Some people talk about training, speculate about it, read about it, and only do it an hour or two a week, most but not all of the weeks of the year. That can help them get in shape and learn some self defense skills, but that will never lead to mastery. We are training in something all the time. What are these practitioners doing in all the other hours of the week? What is their mind doing? What is their body doing? If their mind is jumping from subject to subject, from stimulus to TV, computer, radio, road sign, phone call, advertisement, relentlessly, then that is the condition of mind they are cultivating. The fact that this chaotic flow is interrupted occasionally by martial arts is good, but the two hours of martial arts will not replace the effects of the 166 hours that week spent in other pursuits. If your mind is pulled by likes and dislikes, anger and desire, jealousy and fear, continually disturbed by the inputs that cascade our way from the modern world then that is the mind we are cultivating. If we take an hour or two a day to train, calmly, powerfully and clearly, if we train our minds to think clearly the rest of the time and deliberately make effort to detect when it is turbulent and to return it to a condition of clarity – even in the midst of action – then that is the life we cultivate. If we want to get the life we want we will have to do the work. The undeniable fact is we are cultivating something 24 hours a day. Our actions upon the outer world – what we do, what we say, what we think – have a transformative effect on our inner world, simultaneously. If we take our lives seriously we can take command of our schedule, use our body and mind well, and cultivate a life that is all we want it to be. Then we can be of use to others and hope to put an end to suffering for them and for ourselves as well. If we float, rudderless, allowing the temptations and narcissistic chaos of contemporary life to carry us along we give up the direction of our own lives, invite disaster, and miss the chance we have to become true martial artists. Mastery, greatness, is not the exclusive right of a special few, ancient masters, talented gold medalists... There is no limit on the amount of greatness that can fit into the world. Put yourself on that path and let nothing stand in your way. You will achieve it. Jeffrey Brooks, Seventh Degree Black Belt, US Shorin Ryu Karate, has been the director of Northampton Karate Dojo in Northampton, Massachusetts since 1987 and director of Northampton Zendo since 1993. He is author of “Rhinoceros Zen – Zen Martial Arts and the Path to Freedom.” His column Zen Mirror and other articles appear on FightingArts.com. 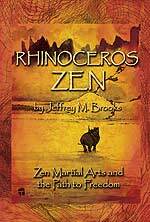 FightingArts.com is pleased to announce its first book: “Rhinoceros Zen –Zen Martial Arts and the Path to Freedom,” by Jeffrey Brooks, a work that portrays the dual paths and interplay between Zen and Karate-do. Fast paced and easy to read, it is full of insight and wisdom. It is a rewarding read for any martial artist.